Metcalfe, ON —Pierre Poilievre, Member of Parliament for Nepean-Carleton, was joined on Monday by local residents, community leaders and project contributors to unveil the completed six month project, fallen but not forgotten. This project sought to add four soldiers’ names, which had previously been omitted, to the local Metcalfe Cenotaph. 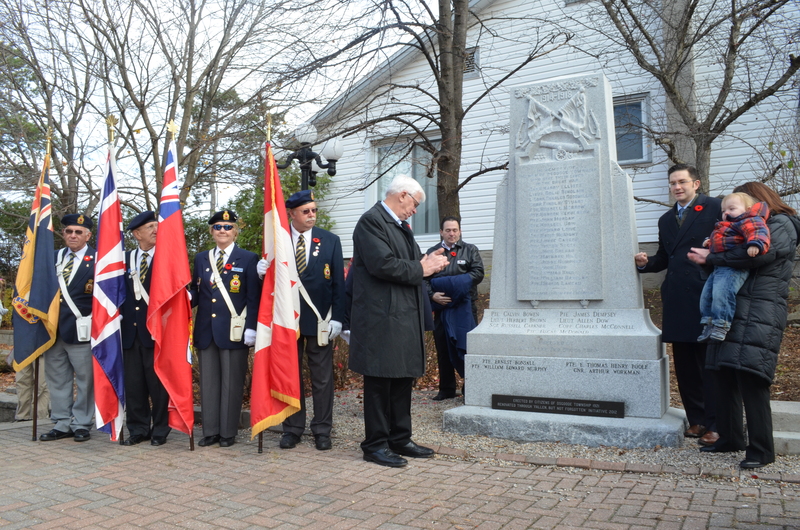 The total amount that was raised between community contributions and a government grant was over $7000, ensuring work would be completed prior to Remembrance Day. With the monuments wrapped in fabric, Poilievre invited those involved in the project to participate in the official unveiling. This group included representatives from donors such as Scotiabank, Giant Tiger, the Osgoode Legion Branch 589, the Metcalfe & District Lions Club and the Vernon Women’s Institute, as well as Brewster and Atkins-Sheldrick. The work performed on the cenotaph includes the reparation of one name which had been missing an “N”, the cleaning of both monuments and the flag base, as well as the installation of a new sub-base on the World War I monument bearing the names of the four omitted soldiers: Private Ernest Lytton Bonsall, Private William Edward Murphy, Private E. Thomas Henry Poole, and Gunner Arthur Workman. Relatives of one of the soldiers, Private “Ernie” Bonsall, came from southern Ontario and Poltimore, Quebec to participate in the ceremony. Cindy McClelland, a relative from Poltimore, has written a book on the Bonsall family history. Elizabeth Hendershot, the niece of Private Bonsall, and her daughter Nicole spoke about their family’s connection to this part of history. “While the sacrifice of Uncle Ernie can be a painful memory, it is inspiring to know how much he sacrificed to make sure that future generations, like myself and Nikki, could experience the freedom that we currently enjoy today,” said Elizabeth. “Our family will continue to honour the sacrifice of Uncle Ernie and we are grateful to everyone who has assisted with this project.” Elizabeth also explained that her grandson is actually named in honour of Ernie to carry on the tradition of remembrance. With this project now coming to a successful conclusion, Atkins-Sheldrick says the possibility remains that other names are still missing. She says that she will continue her research and work with the Legion and Mr. Poilievre’s office to ensure that all of our local veterans are honoured and remembered forever. Poilievre, Thompson and Brewster unveil the renovated WWI monument with Nicole Hendershot, the great-niece of Private Ernest Bonsall, and her son.